What you are looking at is evident: a view towards the east of the sweep of the Bay of Naples from Mergellina at the bottom to the Egg Castle at the top, with Vesuvius in the background. (The smoke may be artistic license, but the volcano was more active then and a little bit of smoke was not uncommon. The then new road along the bay is via Caracciolo, finished in 1890. The draft for the poster was probably sketched from a point above the Mergellina harbor on the way up to Posillipo. The trees on the left beyond the breakwater are the Villa Comunale; the Dohrn Aquarium is the somewhat foreshortened brown building in the trees along that road. The closer white building across from the triangular pier no longer exists; it was an exposition hall. The pier and breakwater are still there; the latter was lengthened a short while ago to accommodate boats in the America's Cup. 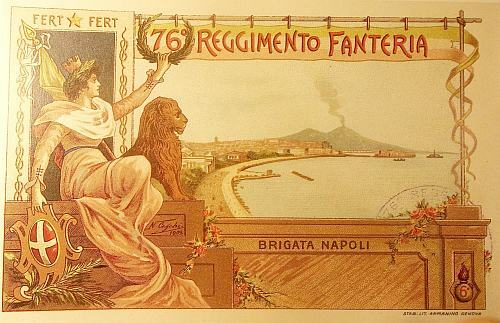 The scene is an allegorical representation of Italy (almost always a woman in mythological garb) crowning with a laurel wreath a military unit, the 76th Infantry Regiment – the Napoli Brigade. That unit began as the 6th Grenadier Regiment (shown by the symbol in the lower right, the grenade with flame and the numeral 6) in April of 1861. The grenade plus flame is the symbol of all Italian infantry units. The unit was active in the 1860s to help suppress remnant Bourbon troops who had not surrendered to the forces of the new nation. The unit was renamed the “76th” in 1871, with Naples Grenadiers added to the name, presumably because that is where they first saw action. The general artistic style, the tromp l'oeil illusion of the flowers on the terrace wall, the style of the garlands, is typical Art Nouveau, a very popular style in the 1890s. The card is an exact duplicate (except for the date) of one I have seen, dated not 1902, but 1905. It is not clear (at least to me) if the laurel wreath represents a unit citation for a particular event or is just a general award. I suspect the latter, since the only significant action in the 1890s was in Eritrea where Italy suffered a humiliating defeat at the hands of a native army at the Battle of Adwa in 1896. Lady Italy's right hand is touching a shield that bears the symbol of the House of Savoy, the ruling dynasty between unification (1861) and the declaration of the Republic (1946). The symbol is a silver (not white) cross on a red background and goes back to Tommaso I of Savoia (1177 † 1233). I don't know specifically, but the red of blood is commonly used to represent courage, and silver might the metallic color of a sword. The lion seated next to Italy might be just a general symbol of courage and strength. There are some regions of Italy that have the likeness of a lion on their crests, but neither Naples nor the Campania region is one them. Ancient Rome used a wolf or an eagle, although the lion shows up on some Roman legion equipment. There are number of lions in statuary around Naples, but they don't really look like this one. Not sure. My guess is general courage and strength. Above and in back of lady Italy you see FERT (star) FERT, the slogan of the Savoy dynasty and here you need all the luck you can get. Either written (or spoken) once, FERT, or often three times, FERT, FERT, FERT, the slogan was adopted by Amedeo VI (1334-1383) of the House of Savoy in France. One plausible etymology is that it is from the Latin verb meaning “to carry” or “support” and is a declaration that the monarch will always support the kingdom. It might also be an acronym; there are various candidates, some of them plausible--Fides Est Regni Tutela (Faith is the Protection of the Kingdom)--and some are purposely silly, such as Fœmina Erit Ruina Tua (women will be your ruin). (Those are the best ones!) It might be an old form of the word forza (strength), which even in modern Italian is used to encourage people in the sense of “Let's go!” I think the word is shown twice for reasons of symmetry so you can separate them with a five-pointed white star, known here as the Star of Italy. And finally, the crown worn by lady Italy is of a type called 'crenellated'. It is a reference to the typical gap-toothed configuration of medieval battlements; i.e. a defensive wall broken by spaces (crenels). (The 'teeth are called 'merlons'.) There was a time in medieval England when you were granted a license to 'crenellate', meaning to fortify your castle with more such gaps. After a while, crenellation became a status symbol —the more crenels, the higher your status. As a crown, they symbolize nobilty, aristocracy and power. The crown, however, bears no resemblance to any real crown in Italian history. Keep them cards and letters comin', folks.